The Bollinger Special Cuvee–their standard non-vintage bottling–is composed of mostly Pinot Noir, followed by Chardonnay and then a bit of Pinot Meunier. Like Krug, Bollinger ages its Champagne in oak and experiences some malolactic fermentation, so there’s both quite a bit of toastiness and richness. (Unlike Krug, it is about $60 retail.) This wine was full, creamy, with just a hint of green apple and lemon. 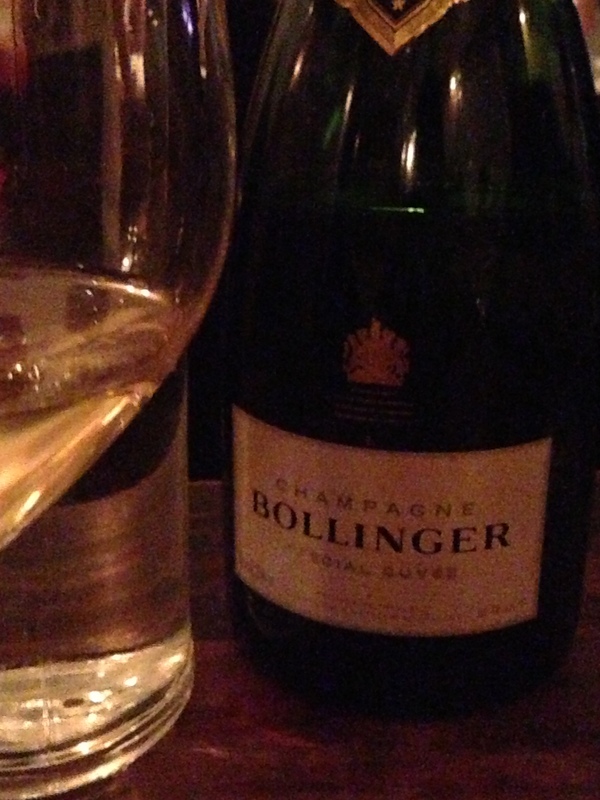 Apparently, James Bond is fond of Bollinger: I can see why. As for the restaurant: excellent. Be sure to get the pork belly sandwiches. The pork belly is melt-in-your-mouth tender and was the best thing I tried that evening–besides, of course, the wine. Other standouts were the pig tails “buffalo style” (impossibly crisp, with a very spicy, nicely vinegary sauce) and, interestingly enough for such a restaurant, the brussels sprouts with pancetta, parmesan, and a soft-poached egg.